The Mt Gravatt Lapidary Society is better known to its members as MGLS. We are a small community based, not-for-profit organisation, promoting and teaching the art of lapidary and its allied crafts to the wider community. Our membership dynamic includes all ages (from 10 to 90) and consists of a diverse cultural background. We are very grateful to have a selection of members willing to act as interpreters for the club instructors when necessary. 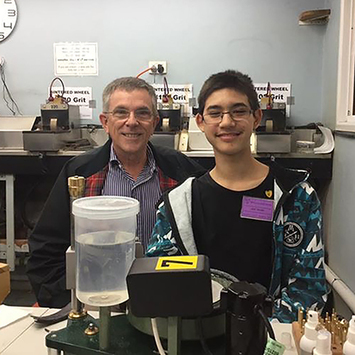 Mt Gravatt Lapidary Society is able to offer its members up-to-date equipment and techniques. This is due to the hard work and persistence of members as well as the support of all levels of government through generous funding grants. Our instructors and members love to keep up with the ever changing trends and styles. This is achieved through research into new and ever evolving techniques. Styles and techniques are also being discovered by advanced members by experimentation. Members are constantly pushing the limits of techniques and equipment to satisfy the needs of the ever increasing younger membership base. We are more then happy to have a chat, so if you are interested in the Lapidary and the allied crafts feel free to drop by the clubhouse during any session time. Our volunteers are always willing to show you around, explain how the club works and the costs involved, however don't forget to wear closed in shoes.